which makes it the perfect venue. Last night at Velo Cult something sort of amazing happened. 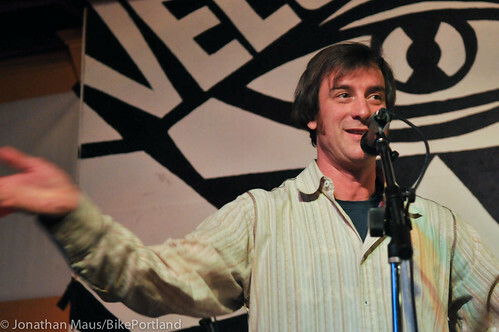 It was the inaugural Open Bike Night, a new event thought up by Sellwood resident Dan Kaufman. While only a handful of people showed up, Kaufman and his CrankMyChain crew put together an entertaining variety show that had a strong thread of bike love woven through it. 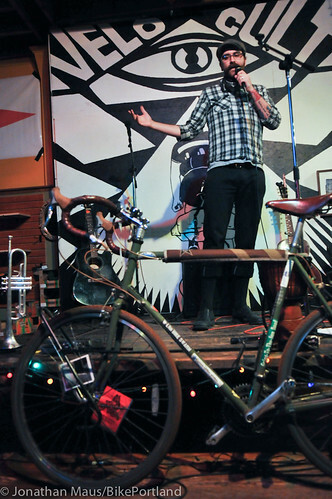 Open Bike Night is a play on open mic night, and the idea is the same. VeloCult Bike Shop and Tavern on NE 42nd Ave in Hollywood provides the venue and the stage, and CrankMyChain brings sound equipment and keeps the show lively. 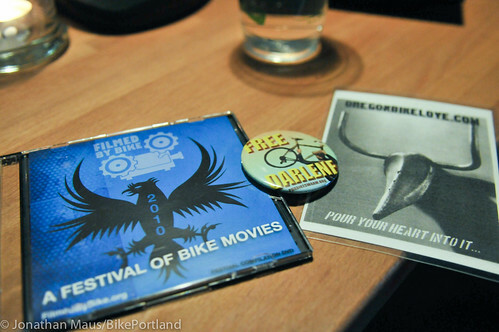 There’s time for socializing and sharing propaganda (I grabbed some cool spokecards, got a free Filmed by Bike DVD (thanks Ayleen! ), a button, and some other cool stuff), and of course sampling Velo Cult’s fine (and growing) selection of beer and cider. 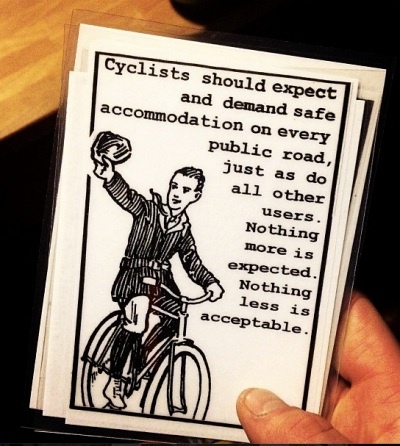 Spoke card made by Shonn “Jolly Dodger” Preston. Check him out on Facebook. 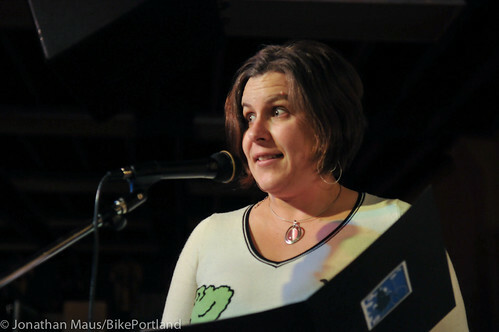 Filmed by Bike founder (and much more) Ayleen Crotty shared info and the new promo trailer for this year’s big event. Ilima Considine of The Sexbots was up next. 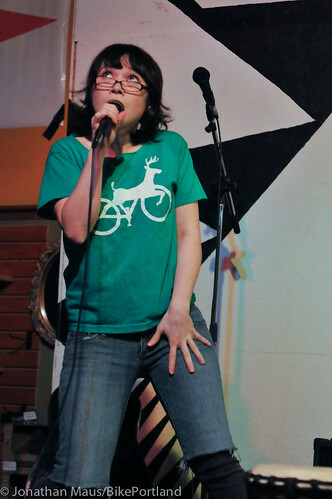 She performed a spoken word piece. It wasn’t quite singing, but it wasn’t quite simply talking either. I’m not sure exactly what she said but I heard enough and saw enough to know it was pretty steaming hot. Let’s just say she really got into it! 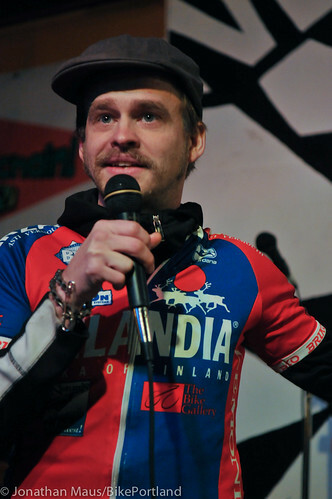 Next up was Dan’s co-conspirator and all around bike culture guy Zed Bailey (a.k.a. Tall Bike Jesus). Zed shared a video he made from the seat of his tall bike. It was a mix of interesting angles, beautiful imagery, and point-of-view perspectives. Nice work Zed. Then we heard from Mike Hernandez. Mike works at Coventry Cycle Works on Hawthorne Blvd. 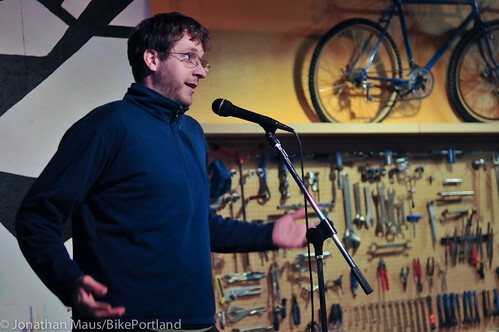 He shared the story of his unfortunate arrest and the confiscation of his bike that happened during an Occupy Portland protest back in November. Mike was pepper sprayed and shoved by Portland Police officers in a melee during the protest. He’s still charged with several crimes, and while he’s gotten his beloved Darlene back, he’s still going through the court system to try and clear his name. Next up was Kirsten Kaufman. 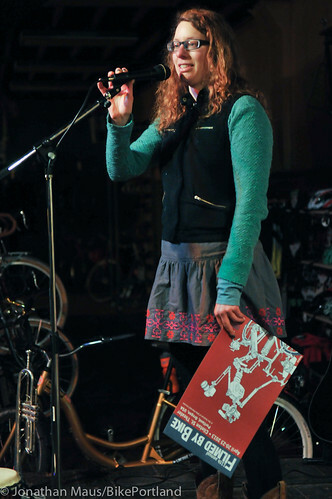 She read a bunch of old poems and excerpts from 1800s newspaper articles about bikes. Here’s one that was taken from the Kansas Cycler newsletter in October 1895. The final performer of the night was Nathan Jones. Nathan is a local endurance rider who’s next big adventure is to ride 325 miles — from Portland to Southern Oregon via the Willamette Valley Scenic Bikeway — in one day (yes one day). He’s doing it just because he loves to ride; but he’s also trying to raise money for a big bike trailer that would be the size of a travel lane and that could aid in street reclamation actions. Learn more about that idea on his WePay fundraising page and you can follow him at GiroProtagonist.com. After everyone had their chance to perform and share, Dan took the stage with a few friends (including none other than Robert Ping, who works for the Safe Routes to School National Partnership) for a rocking final jam session. 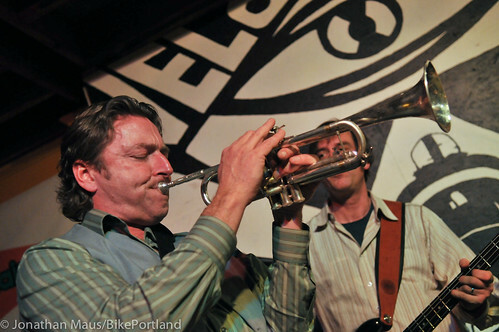 Robert Ping nailing it on the horn. I think Open Bike Night has great potential. The format and the venue are perfect for building community, expanding bike culture, and just having a good time. Oh, and did I mention that the entire thing is broadcast live to YouTube for the entire world to see? 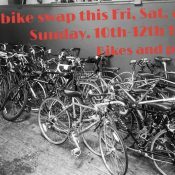 Open Bike Night happens the next two Wednesdays in a row (the 23rd and 30th) at the same time (7:00 pm) and same place (Velo Cult Bike Shop and Tavern, 1969 NE 42nd Ave). I hope more people show up next week. Let’s give this thing a chance. I think it can turn into something very worthwhile. Thanks for hosting us Sky (owner of Velo Cult) and thanks to the CrankMyChain crew for the idea and great execution! This sounds like a great night, thanks for sharing, I’ll definitely make a point to try and go! There’s no way it’s 325 miles to Eugene, unless you’re going through Bend. The Willamette Valley Scenic bikeway is more like 125 miles. Hey Michael.. I know! I actually thought about this mistake last night right before I went to bed. Thanks for reminding me to fix it. 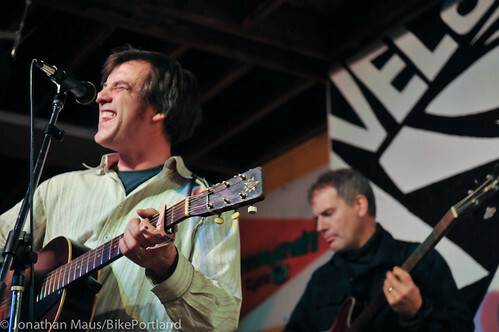 And if anyone should know it’s you… the master of long bike routes around Portland. Cheers and hope you are well. I love the concept for Open Bike Night and hope to see it continue. People sharing their stories and talents on stage, drinking beer, chatting with friends, watching a dude working on a bike… so cool. Oh, yeah, and then there’s the whole “broadcasting live on YouTube” element. Wow. Nice work, Crank my Chain crew. I attended the event having zero expectations going in. 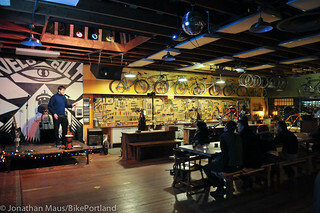 I have to say that I really enjoyed the night and it had me thinking about ways to use it to get more people on mountain bikes, as well as the current mountain bike situation here in Portland. “Ride to Where You Ride!” Thanks to the organizers for doing this. I never doubted your abilities to stomp 300 +. Inspired, indeed! z. Thank you for the great photographs and recap, Jonathan. Ayleen, thank you, too. We’ve posted a 1.5 hr recording http://youtu.be/1eB15B6gMVk (we introduce you at about 00:06:25). Brian, love the concept of ride where you ride. I totally agree. We would love to have you present next Wednesday and/or the Wednesday after.